Italy, 1976, 80 minutes, Colour. 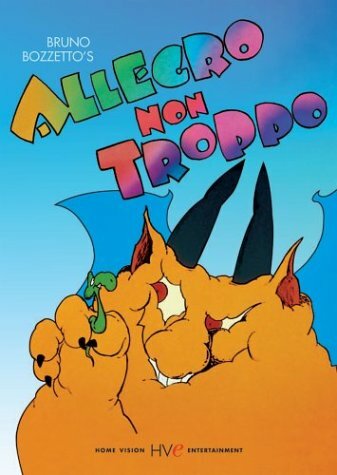 Allegro Non Troppo is a very entertaining parody imitation of Fantasia. It was directed by Bruno Bozzetto, the creator of the humorous and satiric Signor Rossi cartoons. Acknowledging in satiric dialogue the fact that Disney (mocked as Prisney) had made such a film, the authors go on to satirise the style of film that he did, animating music. However, while the content of the animation is humorous and satiric, it is of high quality and is as imaginative (and sometimes more so) as the original Fantasia. The music animated includes Debussy's 'Afternoon of a Faun', Ravel's 'Bolero', a Vivaldi concerto, a work by Dvorak, Sibelius' 'Valse Triste' and Stravinsky's 'Firebird'. There are some satiric interlinking pieces about the conductor, the animator, the producer, and an orchestra of elderly ladies. The film is very entertaining and succeeds in parodying Fantasia as well as being creative in its own right. 2. The selection of the composers visualised, the parallel with Fantasia in themes and styles of animation and therefore the detail of parody e.g. fauns, choreography, evolution, Eden etc.? 3. The quality of the introductory sequence: the sepia, the cleaning girl, the introductory comments and their haphazardness, the chaining up of the artist, the old ladies in their cage and into the truck, their dress, age, the setting up of the orchestra? The atmosphere of mockery? 4. The interlinking passages and the return to live acting? The continued atmosphere of mockery e.g. the ape and the fight on the stage, the animated little man and his being burnt, the food and the meal, the serving out of slops to the old ladies, the attack of the conductor and the smashing of things, the bringing in of the prostitute and putting her and the artist in the piano, the conductor falling through the floor, the ladies' response and applause? The gearing of audience response to the animation through this atmosphere of comedy and parody and mockery? 5. Debussy's 'Afternoon of a Faun': the atmosphere of beauty, feminine beauty, the animation of the devils and their preoccupation with sexuality, the old devil and his various disguises, the fact that the beautiful women were so much taller than he? The satire on sexual attraction and infatuation, men and women, the insects and their guidance of the old demon? Age, his regrets, his seeing everything as a sexual landscape? The blend of the animation and its pace with the tones and rhythms of the music? A valid interpretation of the piece? The rueful feelings and observation of ageing and sexuality? 6. The change of pace with the Dvorak piece? The humour of the choruses and the imitation, the build-up of imitation and rivalry, the satire on so-called development, the building of bigger and better things, keeping up with the Joneses? The self-satisfaction of the leader and having everybody follow him? His falling over the cliff and the mock-humour of the exposed bottoms at the end? 7. The throwing of the Coca Cola bottle and its becoming the basis for Ravel's 'Bolero'? The conception of evolution and the progress of Ravel's music as the progress of evolution throughout history? The visualising of evolution, the imagination in the animals and their landscapes, the continued marching progress, the change of periods of fire, ice and desert, the mutual destruction? The relentless progress? The use of colour? The range of pictorial background? The movement through human achievement and ruin - Christianity, war, modern civilisation? The ultimate with man concealing the ape and his mocking laugh? 8. The Vivaldi concerto and the light touch with the housekeeping bee, the humour and parody of the neat housewife? The threat of the lovers and their picnic? The persecution of the bee and her survival? The bright ending with the sting and the yell? 9. The atmosphere of Sibelius' 'Valse Triste' and the environment of the slum, the alley cat and his dreams, the changing world? The contrasts of urban civilisation and squalor? The ruefulness of the atmosphere and the final disappearance of the cat? 10. Stravinsky's 'Firebird' and the atmosphere of Eden, the Devil and the various devils, the humorous touch with the serpent finishing rejecting the apple? The mock religious touch? 11. The variety of endings and the humorous visualising of orchestrated finales? The mock variations? The argument about Snow White? 12. The quality of the animation? The impact of the blending of classical music with visuals? The delight of the classics for the ear and the irony of humorous animation?